I believe that for our children to grow and develop as well-rounded individuals, they should also be exposed to various areas where they can express their interests and hone their talents, socialize, and have fun at the same time. Extra curricular activities, such as arts and sports programs, are as important as studying academics in school. And we just have to keep an eye on what our kids like to do and where they can excel. 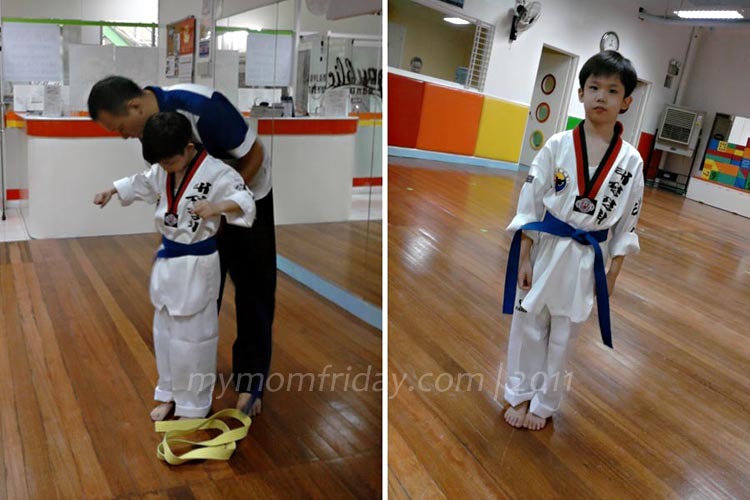 For our boy, taekwondo is it. 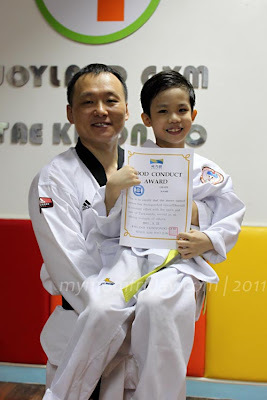 Since summer of last year, my boy has been attending basic taekwondo classes twice weekly. We purposely enrolled him to help build his confidence, improve his focus and discipline, and channel his hyperactive tendencies in a more productive manner. If you have a kid with similar challenges, I highly recommend this sport. Hubby and I have already accepted the fact that he is not the athletic type, and he knows it too! :) He has more creative inclinations with impressive musical and artistic skills, but clearly lacks the physical coordination required to excel in most active sports. Martial arts and swimming are our best bet. Well, he still has hesitations swimming in a "big" pool, so we went with martial arts. Fortunately, there's a taekwondo gym close by and he was willing to try, so basic classes began. 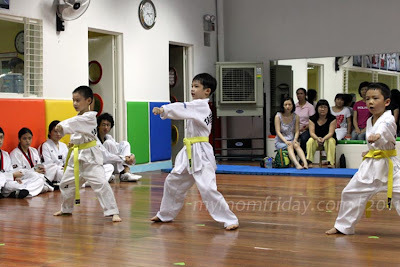 The initial impression we gathered from other parents upon learning about our boy taking taekwondo is that this form of martial arts is "aggressive", he might go into fights, or he might hurt his sister. On the contrary, taekwondo promotes focus, respect, discipline, and self-control, as with the other forms of martial arts. The teachers also help students build the skills and power, and of course, there's that fighting and confrontation aspect for self-defense and competition. It's all in the methods and techniques. Taekwondo is actually considered "a way of life" in Korea. And what from I've been seeing at the gym, the masters are really dedicated to inculcate these practical values in the students as much as teaching the skills for the sport. Fast forward to 2011, he seems to be enjoying taekwondo even more and we are very happy of his progress in the only sport he ever engaged in. He recently earned his Blue belt after the last promotion test so it has given him much pride, more confidence and motivation to continue "playing". And he is looking forward to moving up the colored-belt ladder! 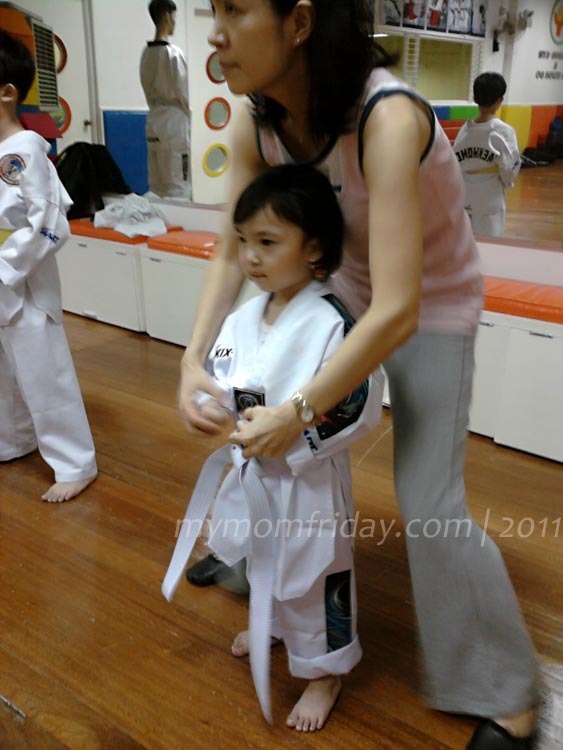 Summer vacation is just weeks away so consider taekwondo, or any sports activities for your active young children. It's great exercise, it's fun, and it teaches valuable lessons too! At the Joyland Gym where my boy is enrolled, they gave out this flyer with the goals of taekwondo training. The gym is run by Philippine National Team coach (Juniors) Master Kim Hyo Jun. Read along to learn what taekwondo it's all about. The youngest student -- my girl also tried it out! Wilson corner P. Guevarra sts.